We have all heard the expression "Time is Money". Eliminate redundancy and wasted time doing multiple processes from multiple systems. With us, it can actually be done from one system! This is exactly what our website and ProMax integration is all about. ProMax and our websites have a direct integration with one another. All updates and changes take effect immediately. 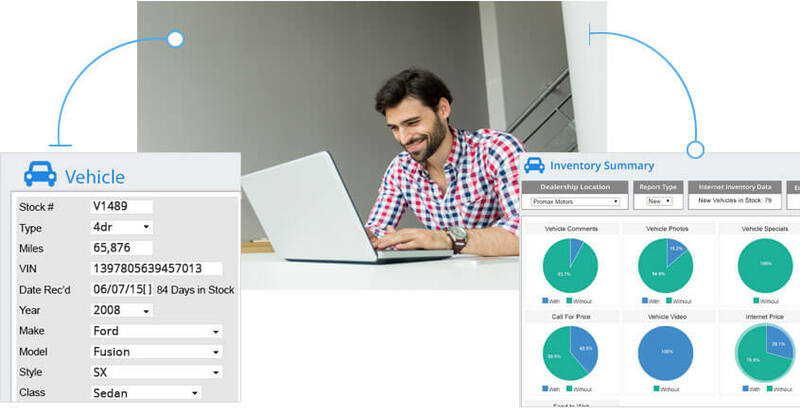 Displaying accurate and up to date inventory online is crucial. You have complete control over your inventory directly within ProMax’s inventory management system. ProMax will automatically update your inventory across your website and any 3rd party websites you associate with on a daily basis; ensuring you always have accurate inventory information displayed across all aspects of your business model. ProMax’s website integration doesn’t just stop with the inventory. All your leads generated from your website are delivered directly and securely into your ProMax system to generate new customer records and begin automated notification and follow-up with each new lead as you see fit! ProMax’s complete ILM software will allow you to seamlessly work your leads from inception to sold status with in depth reporting tools for every step of the sale. With a direct ProMax/website integration, there’s no need to continue wasting valuable time and money managing multiple systems!